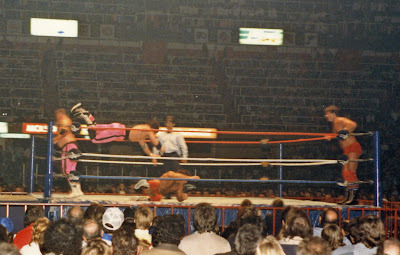 This is Part Three of a four-part series on the December 28, 1986 WWF wrestling show at Maple Leaf Gardens in Toronto, Ontario Canada. See Part One, Part Two, Part Four. These two teams collided over and over again in the late 1980s, and it was almost always good. On the first wrestling show I ever saw, Jacques and Raymond Rougeau took on Brett (before he was Bret) 'Hitman' Hart and Jim 'The Anvil' Neidhart. It was a great match. The Hart Foundation vs. The Rougeau Brothers stole the show on the second show in Newmarket. Loved it. 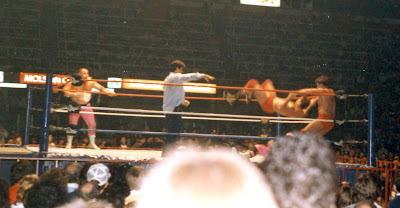 Now mere months into my all-consuming wrestling fandom, I was getting to see them battle a third time as part of a post-Christmas matinee show at Maple Leaf Gardens in Toronto. This post has a lot of pictures! Click each wrestling photo to embiggen. This time, there was a special referee: Danny Davis. 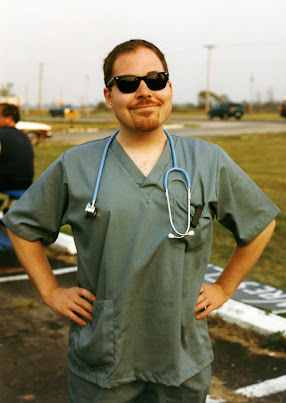 Davis had been a ref for a couple of years, moonlighting as a masked wrestler named Mr. X. But in a long, slow-building angle, Davis was teased as being a biased ref who might have been on the take. Davis had been the ref when Randy Savage beat Tito Santana for the Intercontinental Championship, a decision with a little controversy. Over the months that followed, Davis seemed to turn a blind eye to cheating by heel wrestlers. By the end of 1986, all the subtlety was gone and Davis was being portrayed as being in the pocket of Jimmy Hart and the Hart Foundation. On this night, he was the "Special Referee." as Brett Hart stomps Raymond Rougeau on the MLG ring ramp. allows the double-teaming, but Raymond Rougeau rolls out of the way. At this stage, you could expect the match to play out like this: Babyface Rougeau Brothers start out wrestling with Bret(t) Hart and it's roughly even. Rougeau starts catching the advantage, and Hart gets Frustrated. Tags in Neidhart, who tries to out-muscle the good guy. That still doesn't work. Eventually they take some cheap shots, which Danny Davis conveniently does not see or chooses to ignore. Then the double-teaming sets in, with Davis admonishing the Rougeaus for stupid things like not holding the tag rope while ignoring flagrant infractions by the Hart Foundation. Yet despite the unfair advantage, the good guys make a comeback. The finish comes from Davis reluctantly making a slow three-count for the babyfaces, disqualifying the babyfaces for something stupid, giving the or heels a fast count. of the MLG ring on 12/28/1986. I actually found this to be an unsatisfying way to get heat, compared to the usual "honest but incompetent referee." Having a ref miss something let us be honestly angry and demanding justice. Having an obviously biased official takes some of the fun out of that relationship. It takes the audience reaction down, from "how could you be so stupid?!" to "oh, this again." 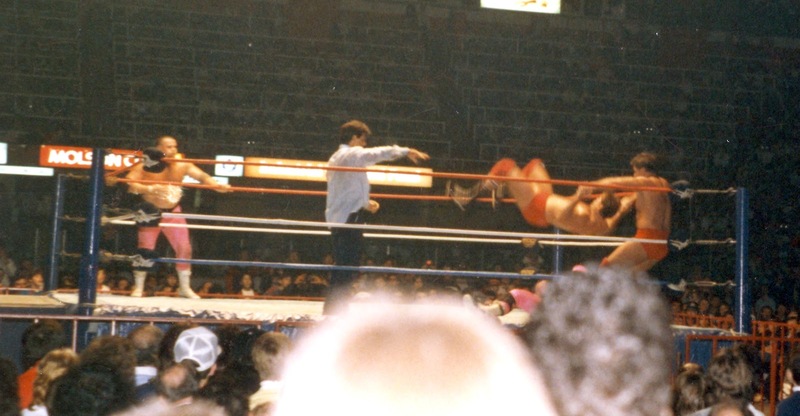 Ray Rougeau takes Bret Hart down with a flying cross body as Jacques, Jr.
ring at Maple Leaf Gardens on December 26, 1986. On this night, The Hart Foundation defeated the Rougeau Brothers. I don't have any record of the finish, though. Huge thanks to my dad who braved admonishment from Maple Leaf Gardens security staff in their white hats and blue jackets, as he walked down from the Gold seats to Ringside to capture these terrific photos. You may be wondering -- where was The Mouth of The South, Jimmy Hart? Good question, reader! I'm not really sure! The WWF had three shows on December 28, 1986. This matinee at MLG, the same crew later that night in Ohio, a show in Omaha, Nebraska headlined by Savage vs Steamboat, and a card in Flint, Michigan at the IMA Sports Arena. I don't know much about that other than that it included Adorable Adrian Adonis. That would've been the "C" show, and perhaps Jimmy was there. Up next: Photos from Hulk Hogan vs. Kamala in a No-DQ match in Part Four! © 1986-2013 Scott Simpson. Awesome Inc. theme. Powered by Blogger.